I saw these baby Brussels sprouts at Wholefoods and couldn’t resist because they were so cute! 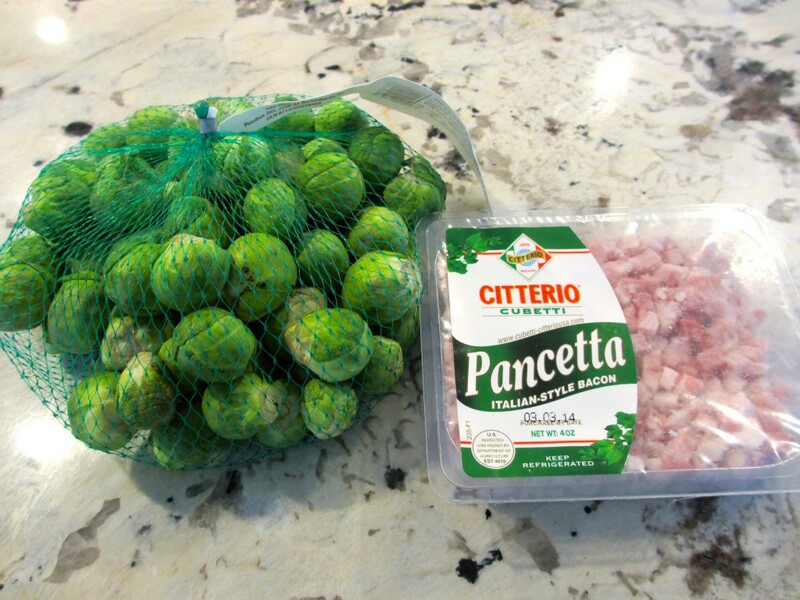 I wasn’t sure what I was going to do with them, but then I remembered that I had cubed pancetta in the fridge and a light bulb went off. 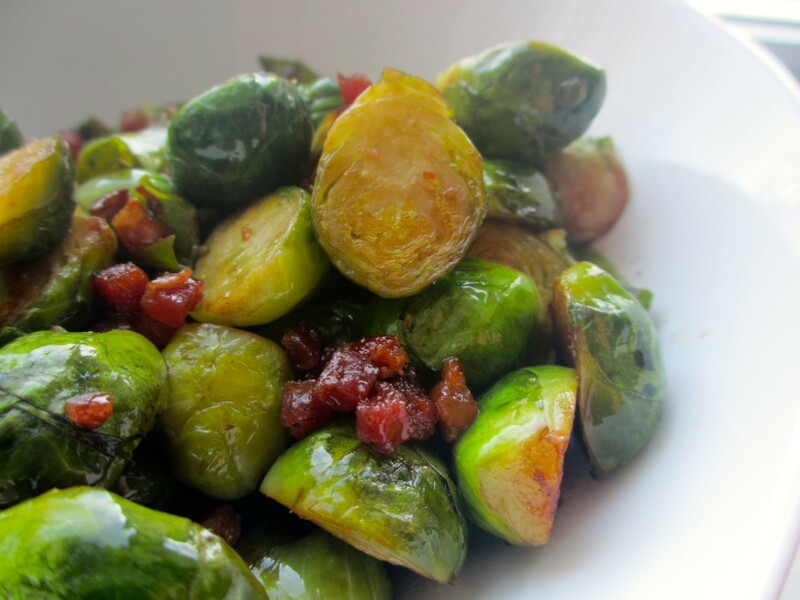 Brussels sprouts and pork go very well together. 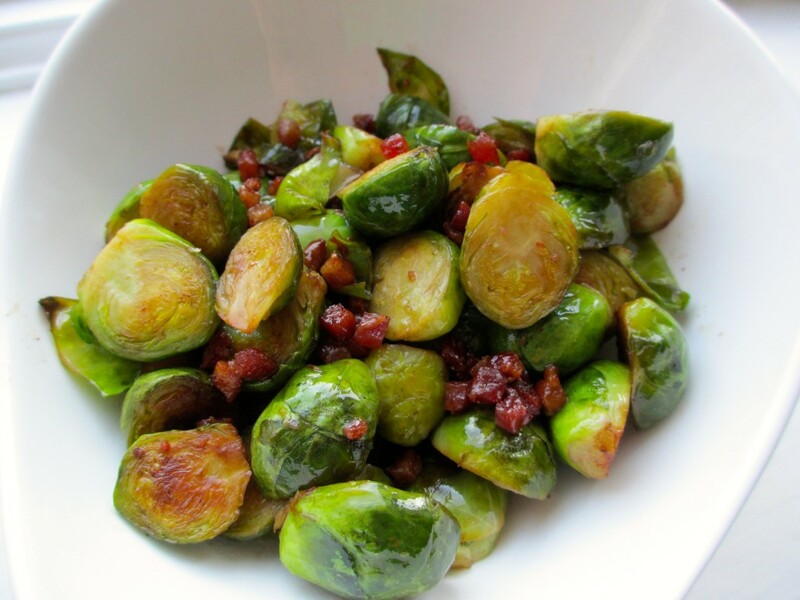 Brussels sprouts are a cultivar of the same species as cabbage, in the same family as collard greens, broccoli, kale, and kohlrabi; they are cruciferous. They contain good amounts of vitamin A, vitamin C, folic acid and dietary fibre. 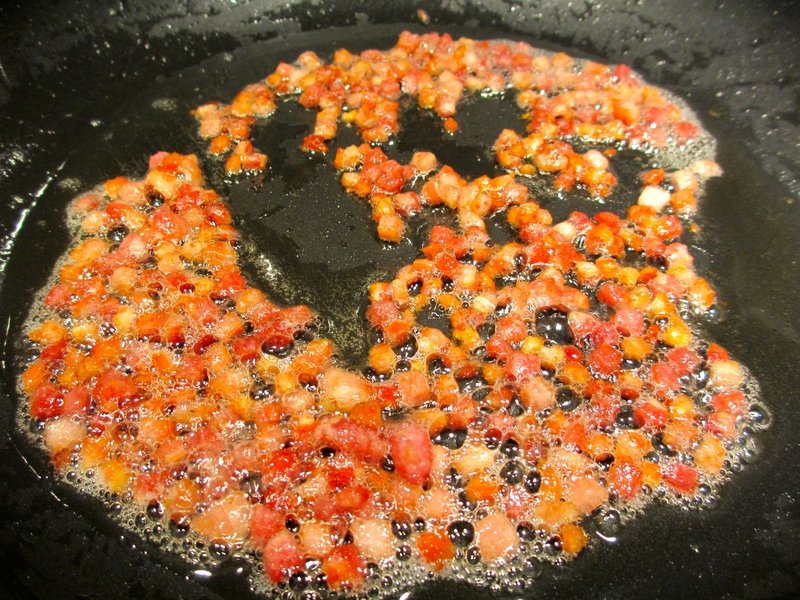 Moreover, they are believed to protect against colon cancer, because they contain sinigrin. Although they contain compounds such as goitrin that can act as goitrogens and interfere with thyroid hormone production, realistic amounts in the diet do not seem to have any effect on the function of the thyroid gland in humans. 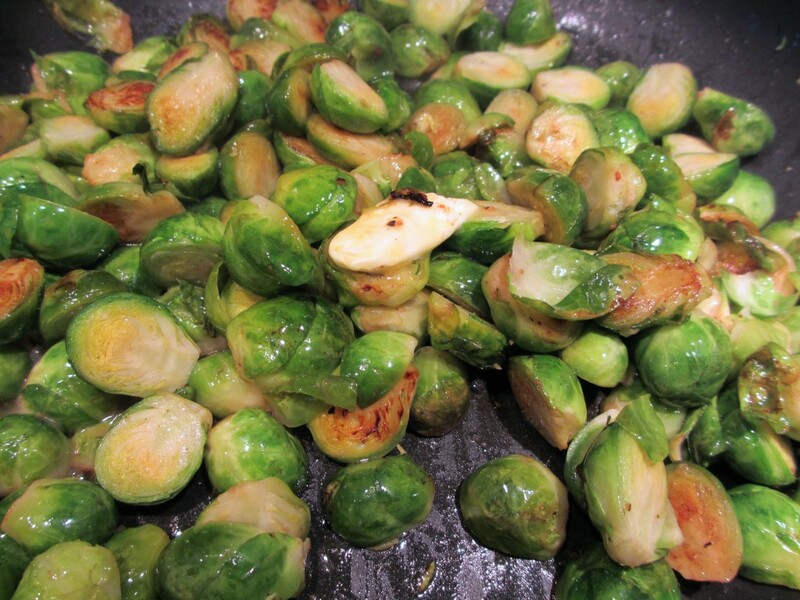 I cut each of the Brussels sprouts in half and set aside. 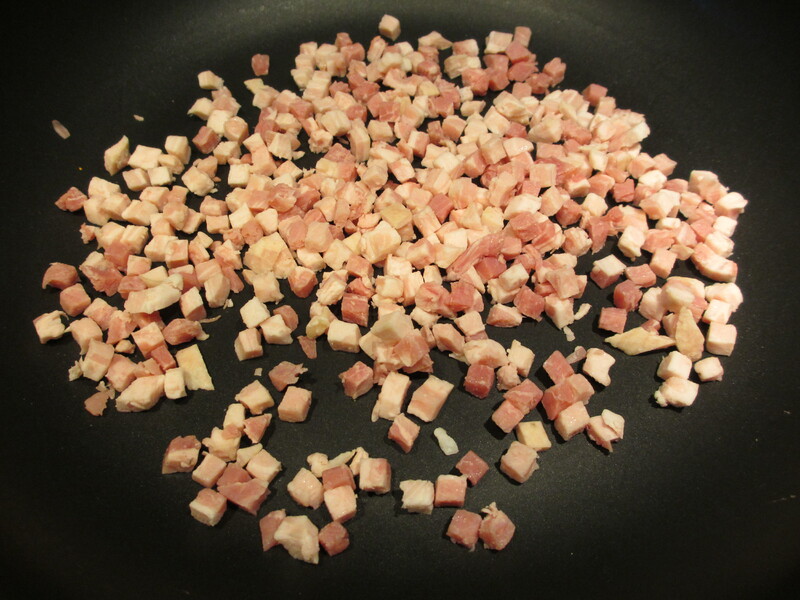 I then sautéed the cubed pancetta over medium-high heat until the pieces got nice and crispy. As the pork cooked down, it released a lot of fat that I would later cook the Brussels sprouts in. 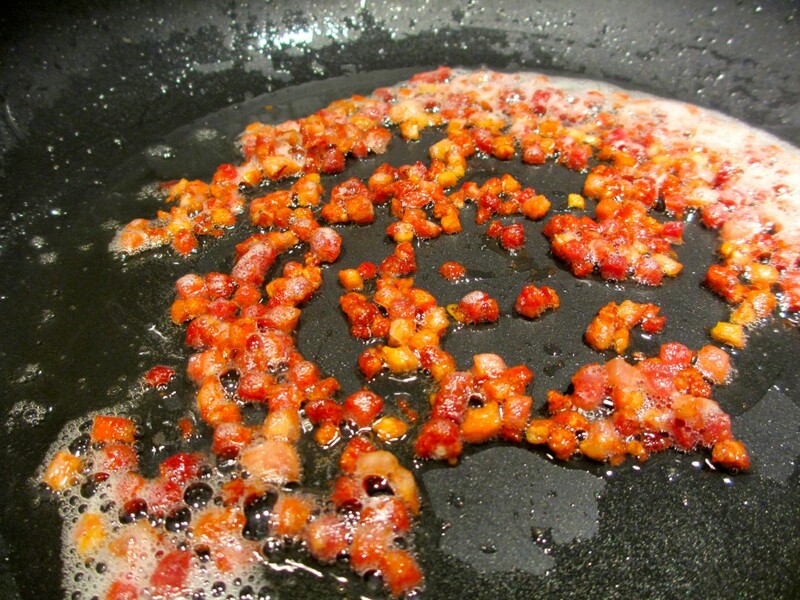 Once the pancetta reached my desired crispiness, I removed it from the pan using a slotted spoon and set it aside on some paper towels (to absorb the remaining grease and to keep the pieces crispy) while I cooked the sprouts. 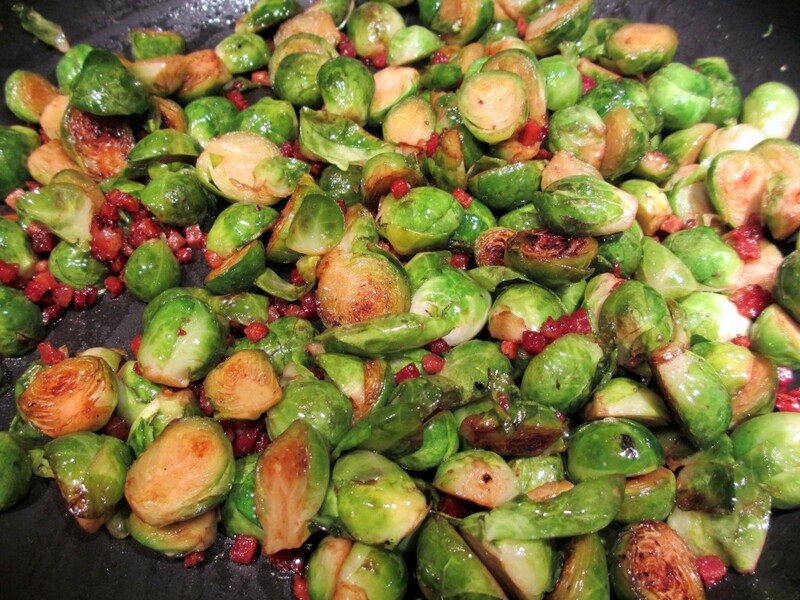 With the pan still on medium-high heat, I added the Brussels sprouts into the hot pork fat and tossed to coat. I then added about 2 tbsp of grass fed butter and tossed until the butter was melted. I gave a couple of good turns (5-6) of fresh ground pepper and fresh ground Himalayan sea salt. When cooking these, try to let them sit for a bit before stirring, so they will begin to caramelize — you’ll get them nicely browned this way. 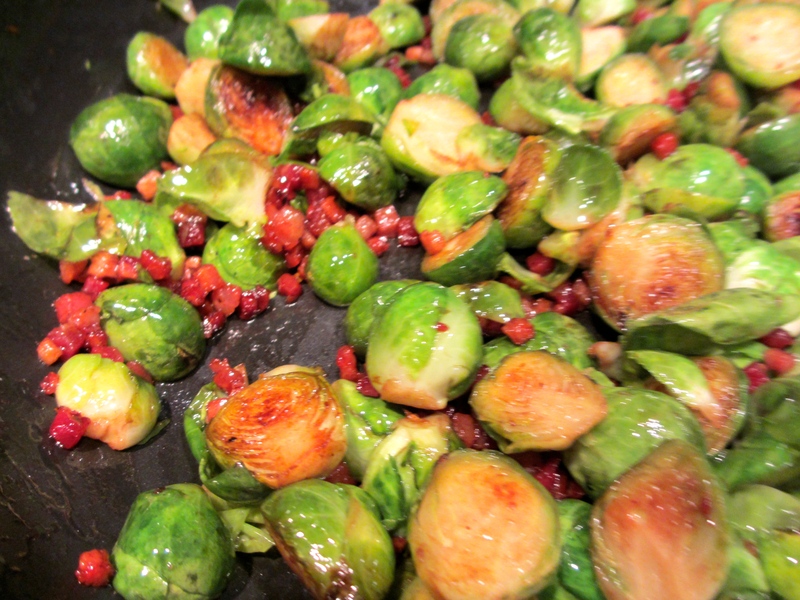 I had a lot of sprouts in the pan at once… browning is much easier when you have less volume. It still worked out fine for me though. 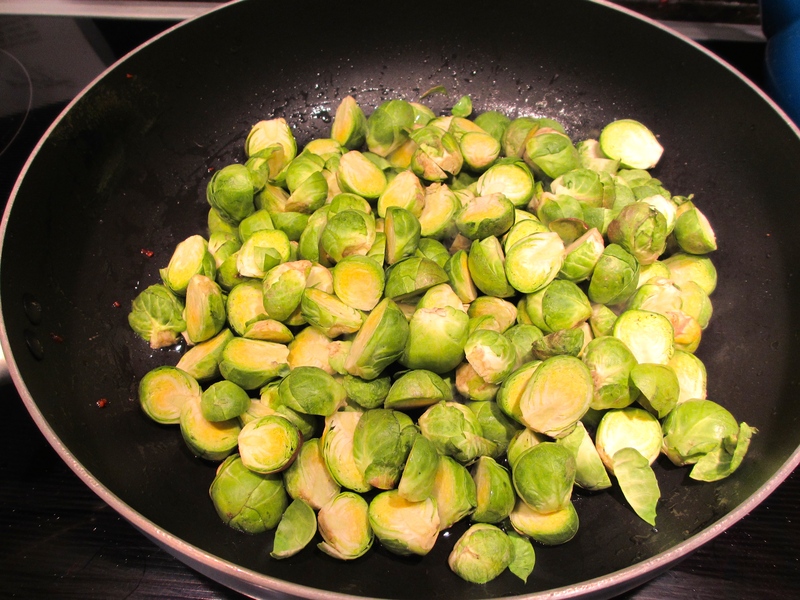 After they were nicely browned, I added a little bit of white wine to the pan and put the lid on to help braise the sprouts so they wouldn’t be too tough. It didn’t take too long… maybe five minutes. After, I removed the lid, turned up the heat and allowed the remaining liquid to burn off. 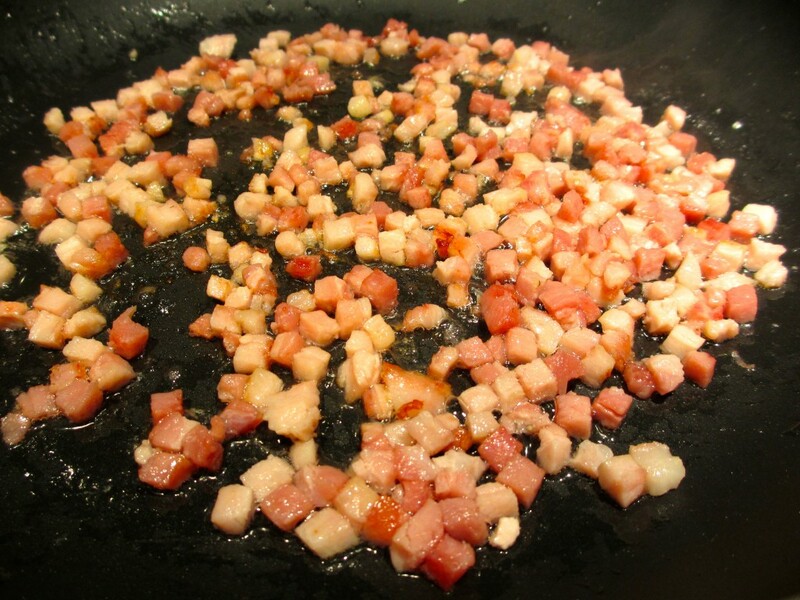 Lastly, when the liquid had completely evaporated, I added the crispy pancetta back to the pan and tossed it to evenly distribute the pieces. I continued tossing for a few minutes to ensure the pancetta had reheated. 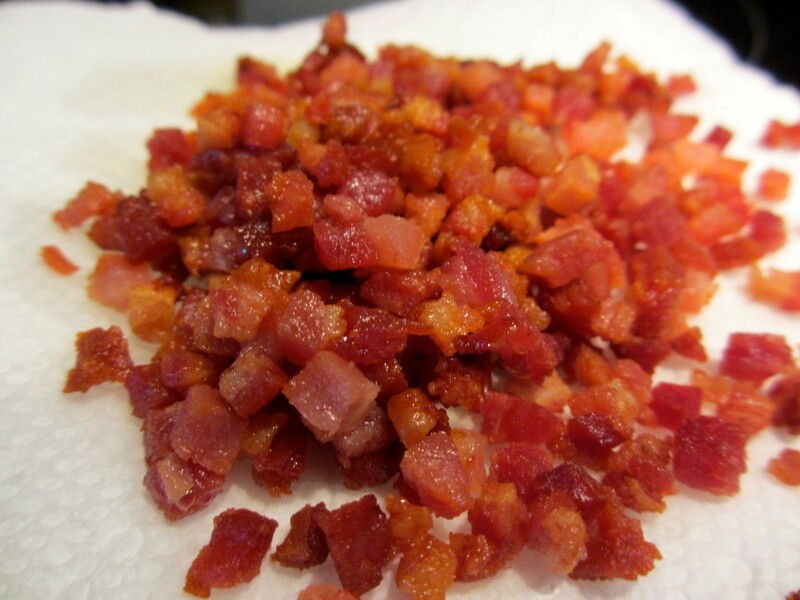 The final product was delicious… and would go well with any Fall or Winter main course. I served mine with a seared pork loin and some baked sweet potatoes.